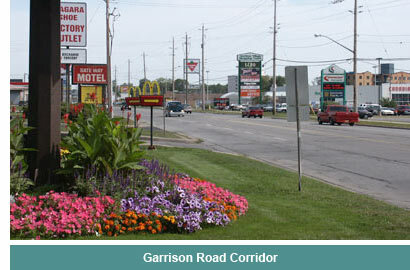 Fort Erie’s newest and largest business district, the Garrison Road business district stretches from Central Avenue, at the foot of the Peace Bridge and follows Garrison Road, otherwise known as Hwy 3, to Petit Road. Home to franchises like McDonald’s, Mark's Work Warehouse, Shopper’s Drug Mart, Canadian Tire, Subway, Pizza Pizza, The Source and Wal-Mart, the Garrison Road business district also compliments and holds dear the smaller mom-and-pop businesses so famous within Fort Erie. As the most commercially dense business district, the corridor, fast becoming Fort Erie’s retail hub, is comprised of strip malls, plazas, grocery stores and stand-alone retailers. Riverwalk, in the "south end" boasts fabulous restaurants, retailers, and a brokerage district.